The MOTOmed viva2 has been successfully implemented for many years in the field of spinal cord injury. In combination with functional electrical stimulation (FES) it causes muscle contractures and movement. This option provides an ”active” training option, despite of complete paralysis. The non irritating electrodes are easy placeable on the appropriate locations on the extremities. Preprogrammed stimulation programs simplify the MOTOmed incl. FES training even more. Individual settings can be saved for any following therapy sessions. The Hasomed Company has created the Rehastim stimulator that compensates for the missing impulses from the brain by functional electrical stimulation of the muscles. Muscular activity is governed in combination with the MOTOmed cycling movement by which the allocation of each impulse is determined at the right time and duration. 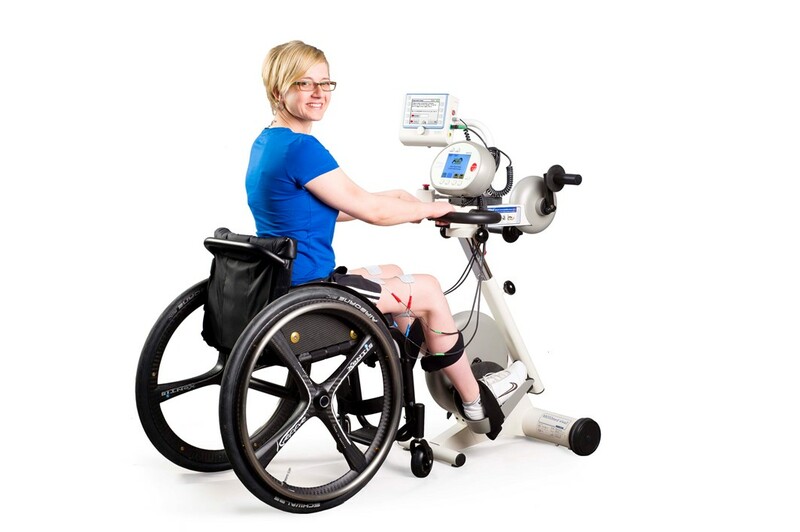 The FES system can be dually combined with the MOTOmed viva2 leg trainer and the arm/upper body trainer. The RehaStim is a 8-channel-stimulator that stimulates four muscles per extremity. The new RehaStim2 offers the possibility to use the functional electrostimulation with children. If you combine the MOTOmed gracile12 with the RehaStim2, even childs and young teenagers can benefit from the therapeutic effects of the FES-Therapy.